My sister recently asked me to make her good friend a baby quilt. Now that it's been gifted I can share it. Her nursery theme is Classic Disney. 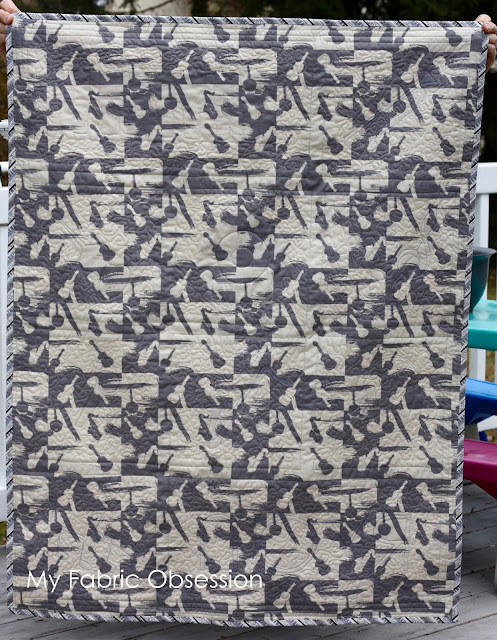 My sister asked me for a Half Square Triangle (HST) quilt. Here is the inspiration photo my sister sent me. This is a poster that will be hanging in the nursery (I don't know anything more about it than what is in the picture). So I pulled all the colors from the poster and here are the results! 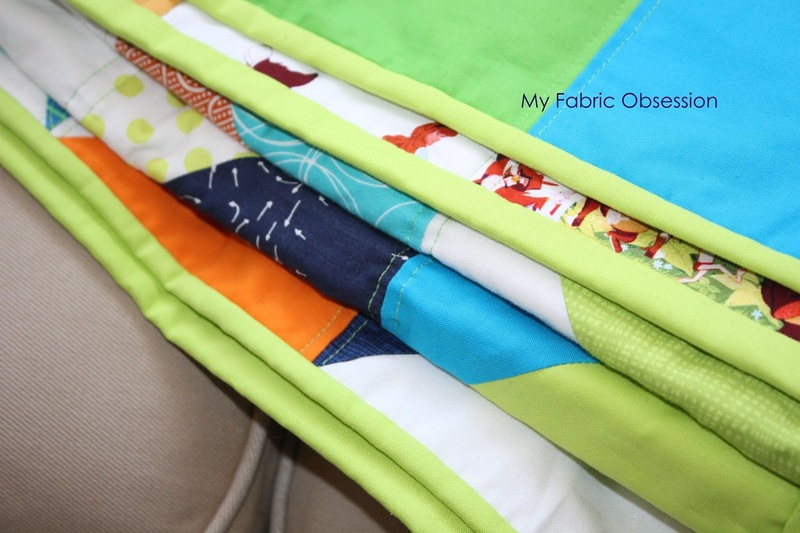 I love these colors so much, I'm sure I'll be making more quilts with them. 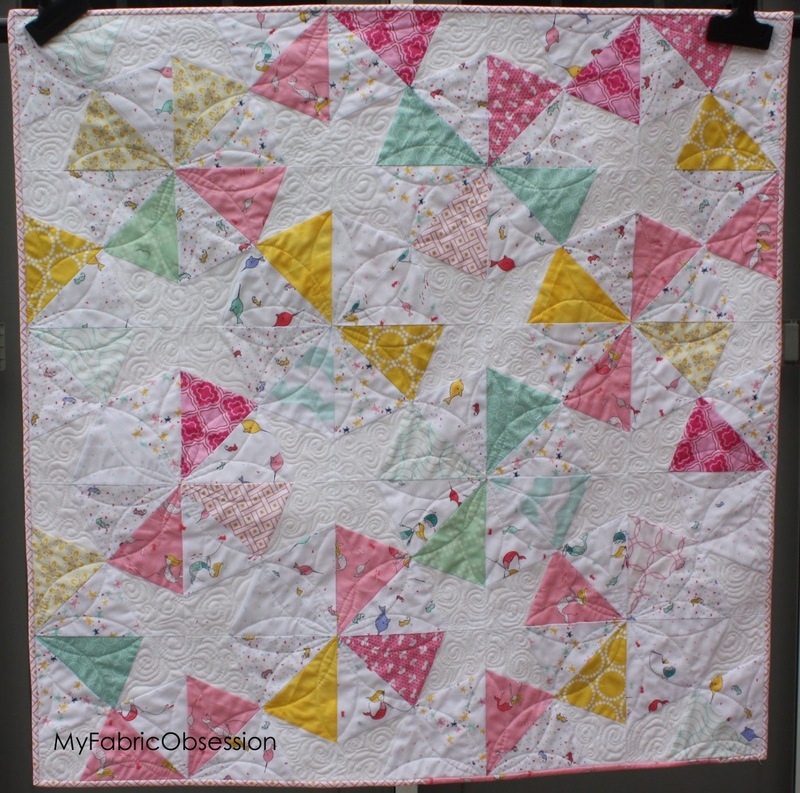 I did straight line quilting on my domestic. 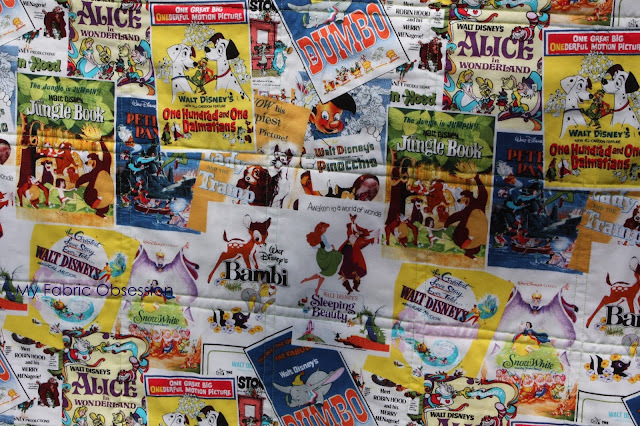 And managed to find the PERFECT backing fabric. 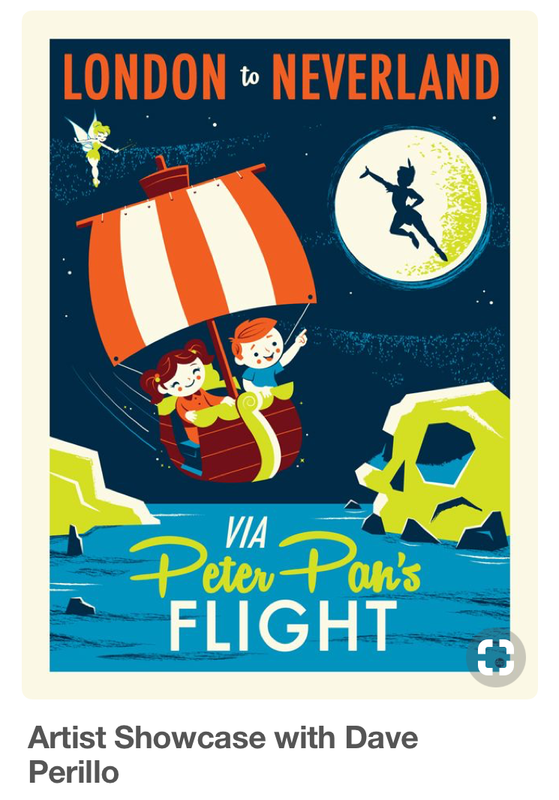 These are all classic Disney posters. 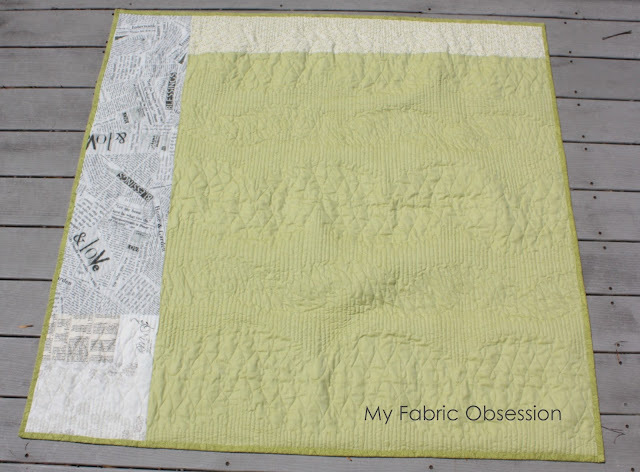 For the binding I decided to go with Lime. I hear the mama considered a lime crib, so I think she'll appreciate the little extra lime. In 2011, I made my mom this king size quilt. My mother, and her mother before her, love to re-decorate so it was time for something new! After talking with her during a recent visit, we decided a bed-runner was the way to go. 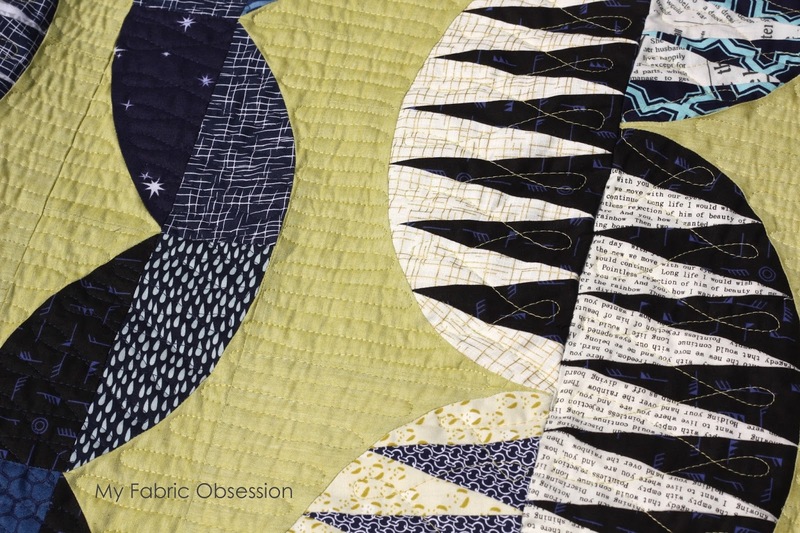 Here's the final quilt in her beautiful Florida room. 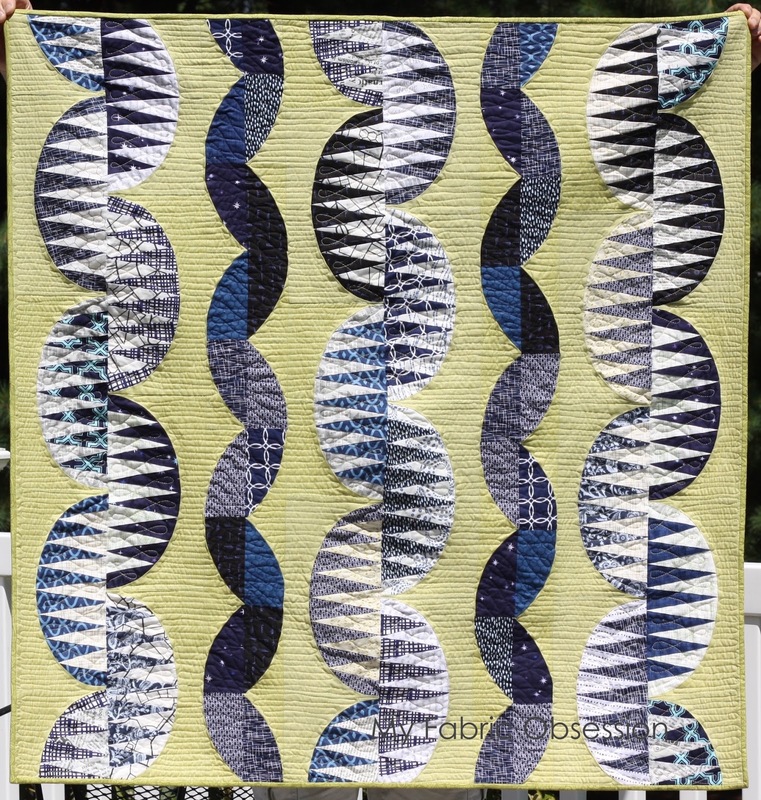 The pattern is "Pair of Pillows" from Angela Pingel's A Quilter's Mixology. Which I have to say - I love this book. If you like curves, definitely check it out. She's got lots of creative patterns in there. I took a few more pictures before it was sent to it's new home. All the quilting was done my me on my domestic machine. The narrow width of this made it so much easier to work with! The backing is pieced scraps. 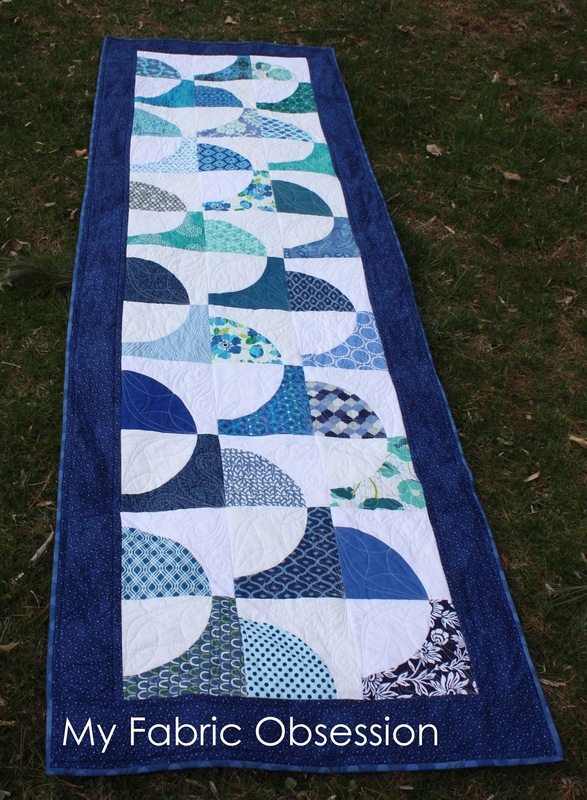 Back in 2013, I made a nautical quilt, stocking and two pillows for a woman having her first baby. I couldn't help her with her 2nd baby due to machine troubles. 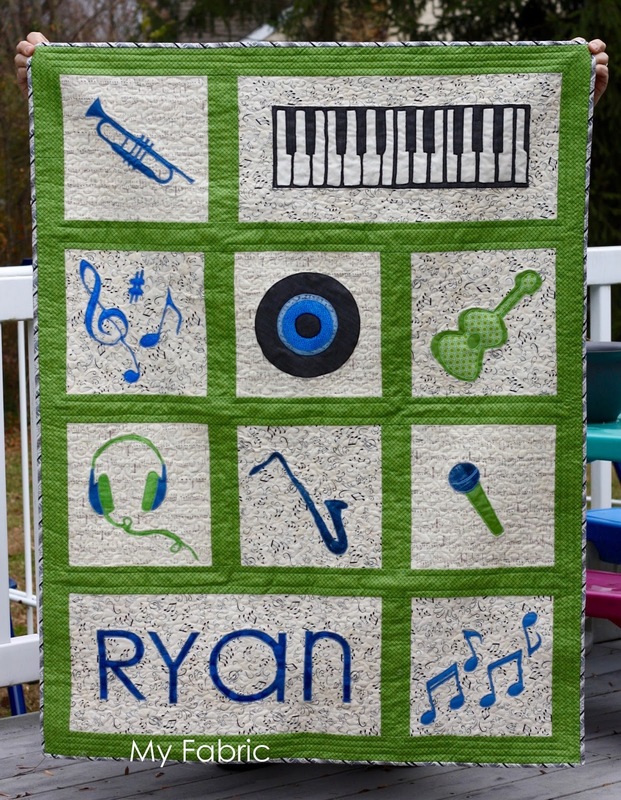 She's now having her 3rd baby and asked me to make a music quilt set for this baby in blues and greens! I finished this quilt earlier in the month, but held off on the post since the baby is due around New Years! This quilt is my own design inspired by some photos the mom sent me. I used my Silhouette to cut these applique pieces. However, my Silhouette is super old (maybe 10 years) and was never meant to cut fabric. It kind of stopped working mid-way through this keyboard and I wound up doing a lot of it by hand. The rest of the shapes worked well, but I do think it might be time to retire the Silhouette until I can replace it with a new model. I considered putting a cassette tap on here as well, but I figured the record would be enough explaining for mom and dad! Haha! 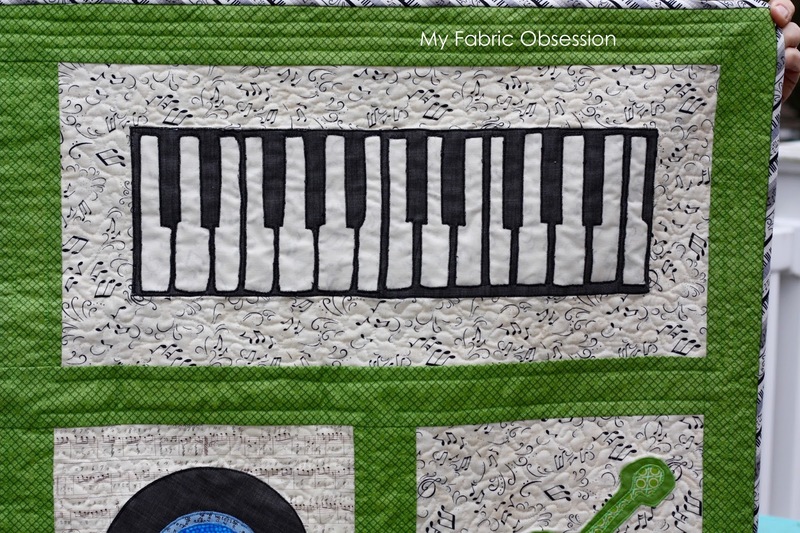 My favorite part of this quilt I think is the music striped binding! This is the first quilt that I forgot to put my label on the back! 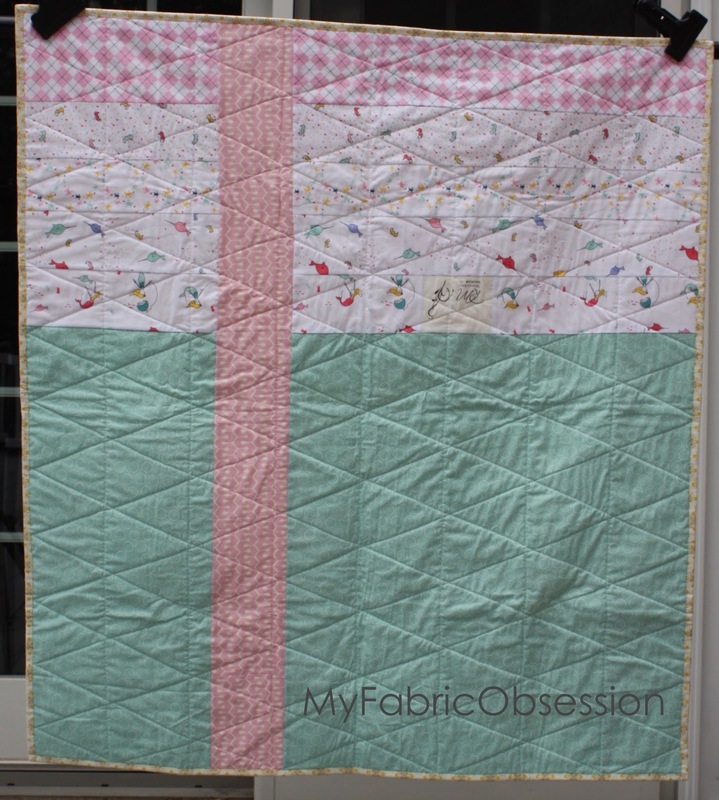 I realized it after I had sewed the binding on, however, I had packed up my sewing room for Christmas and couldn't even sew a label together to hand sew on there! 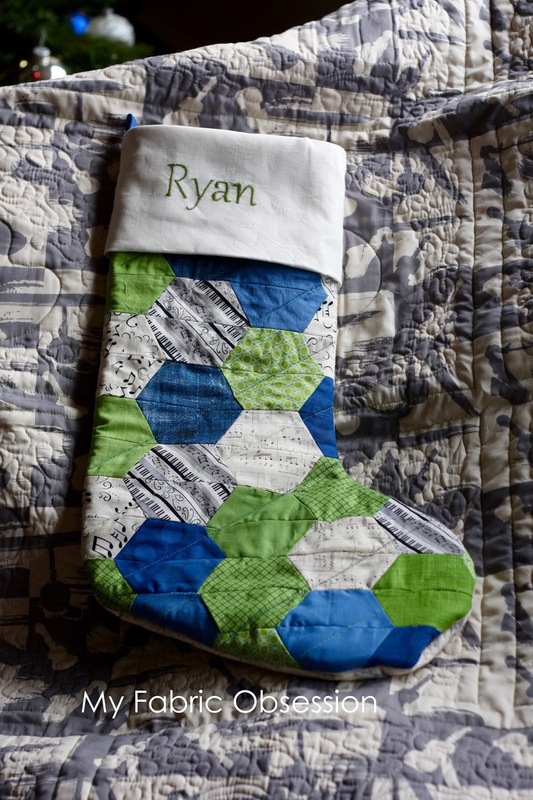 Along with the quilt, I made a matching stocking. I used Amanda Murphy's Modern Holiday book for the pattern. 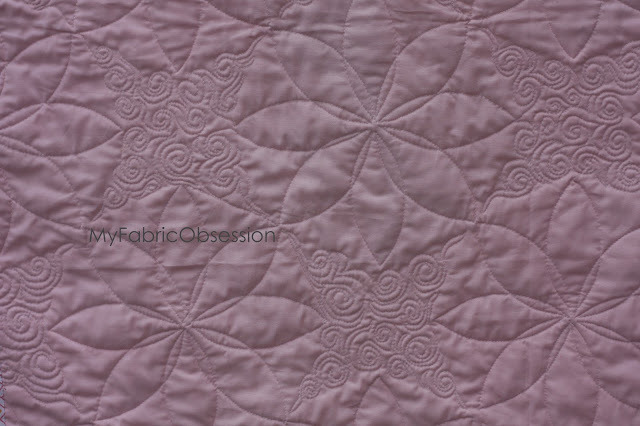 The name is hand stitched by transferring the name on the cream fabric and stitching on top of that. She also asked for 2 pillows. 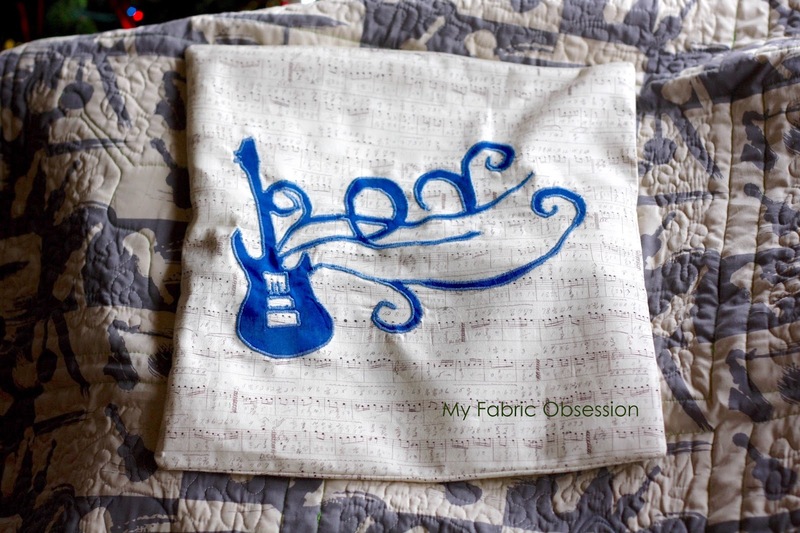 I made one that links to the quilt with this little guitar. The other links to the stocking which of course they both use quilt fabrics! I hope the whole family loves these and that baby boy Ryan arrives safe and sound! What a wonderful new years gift. 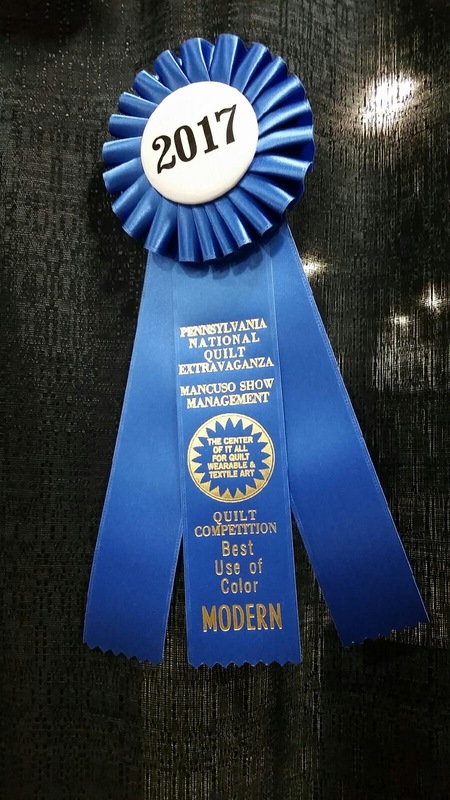 I posted about my Off Kilter quilt and mentioned that I entered a show and then never provided any follow up! 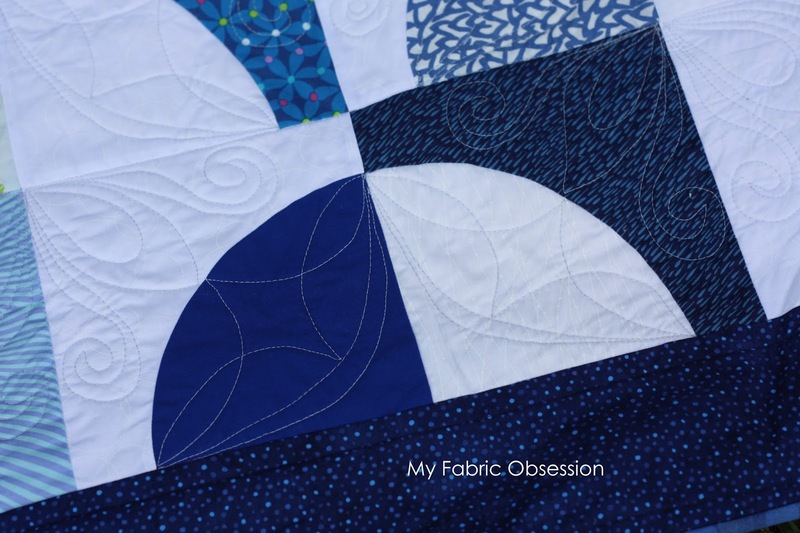 Those of you who follow my Instagram have already seen these, but I think of this blog as my quilting journal. 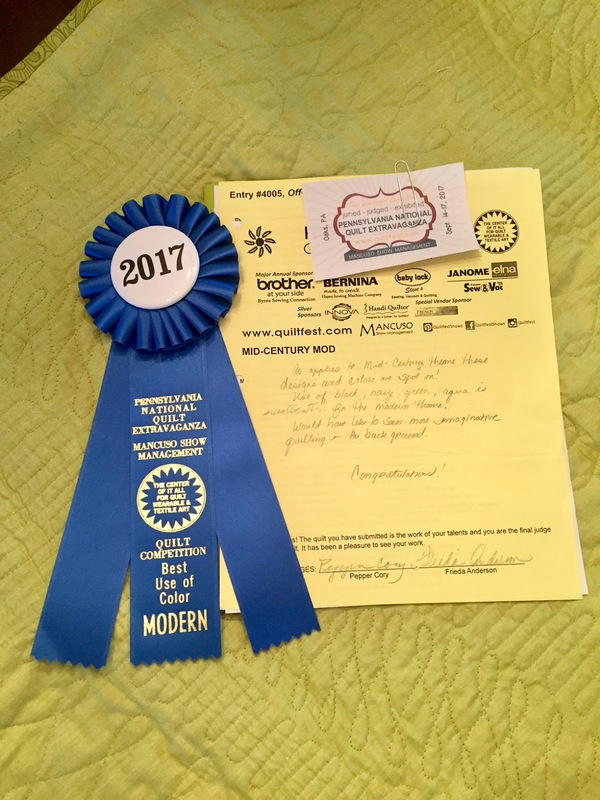 So here's the story of my first ribbon win! I was inspired to actually enter this quilt into a show when we had a talk at Philly Modern Quilt Guild by Jessica Skultety. She talked all about her experiences entering shows and encouraged us all to try. You've got to start somewhere right? I believe at the time that this quilt was on my design wall. And I've told the story of how it was created in my last post. It started with Sarah Bond's pattern Tiger Melon Tiger Moon. (her patterns are class based - you can't purchase them as paper patterns yet). And I combined it with Sew Kind of Wonderful's Metro Twist. So I was looking at this quilt and thinking - if I quilt this well, I can actually enter this one! 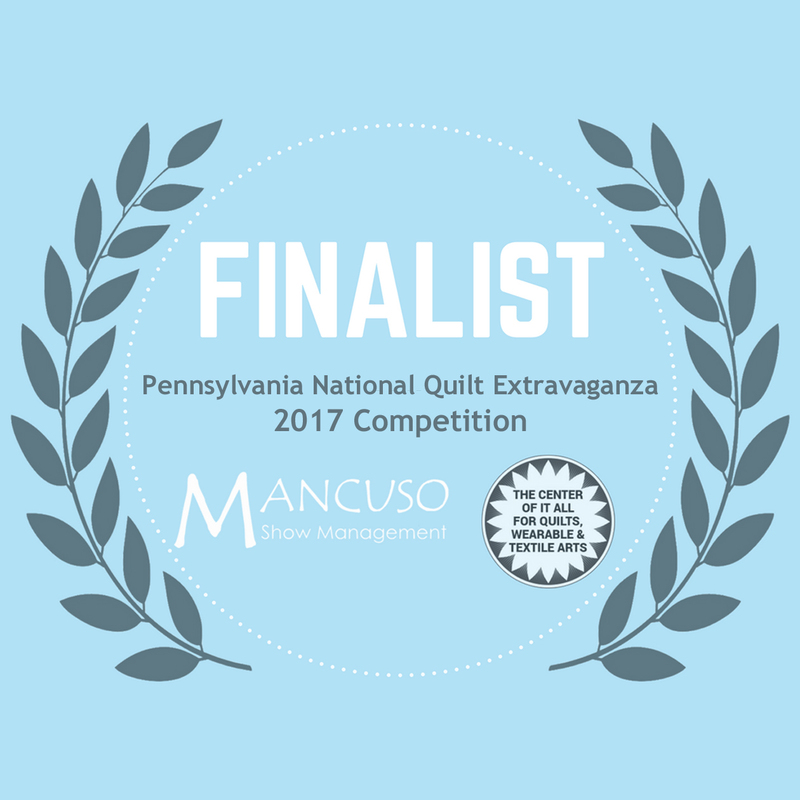 My guild has had exhibits at Mancuso's Pennsylvania National Quilt Exhibit for the past few years so I was familiar with the show and began the process of entering. One of my guild friends had entered also. She received her notice of acceptance and posted on social media. I was on vacation for the week and because they send their notices via postal mail, I had to wait almost a whole week to find out that I was accepted! I was shocked and thrilled! The day of the show, a lot of my friends were at the show because our guild had another exhibit and one of our members (Sarah Bond again!) was giving a lecture. They all knew first thing that morning that I had gotten the ribbon. One had posted on FB teasing me. However, I was at work and had no idea anything had happened. I texted my good friend Denise asking her to go find my quilt. She sent me back a picture of just my quilt and says "do you want to see it's neighbor?". 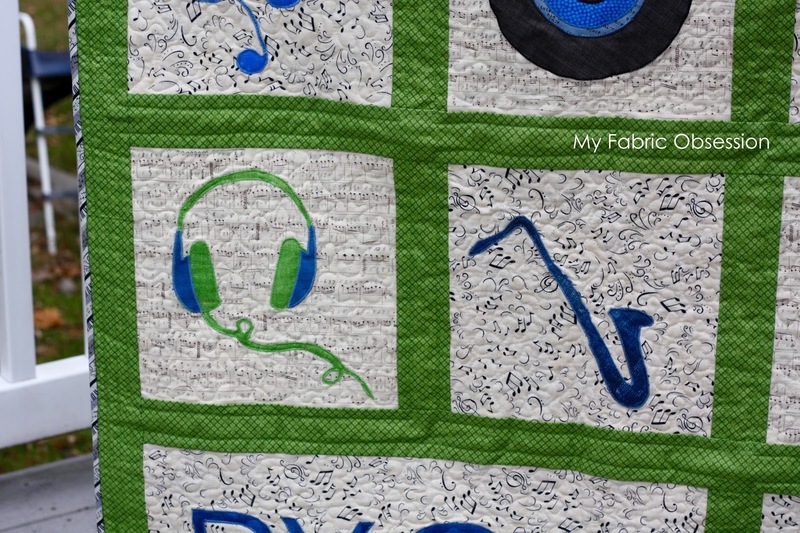 I replied yes, not even understanding why I'd want to see the quilt hanging next to it. And she sent me the ribbon!! Of course I called her right away and we squealed like teenage girls at a concert! I wasn't able to see the quilt myself until the weekend. But the whole family came and we had a great time. I tried to get a picture of me with the kids and my quilt. Pretty much all of them came out looking like this. I finally banished them and got the required photo of artist with quilt. There were so many amazing quilts there. I put photos of a bunch of my favorites on my instagram feed if you want to see some really inspiring work. 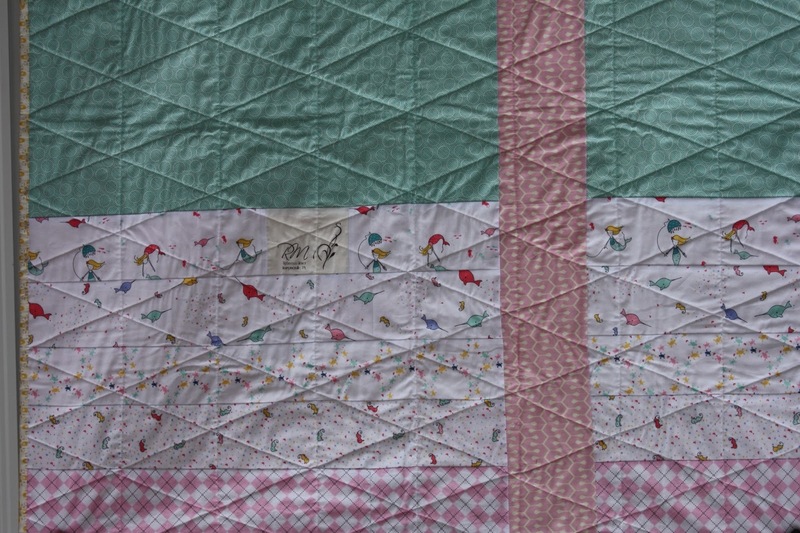 I was so honored to hang with many of these quilts. We'll see where this leads! Lately, my creative energy has been a bit low. 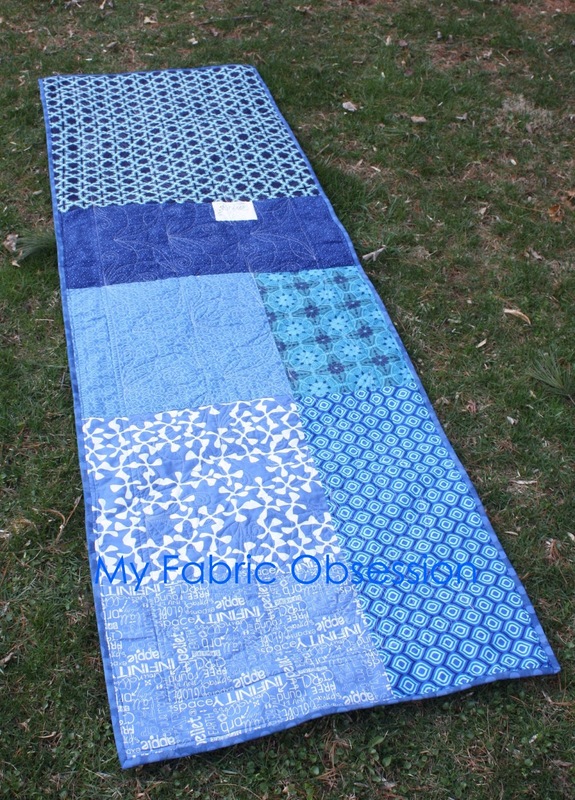 Not sure what it is, but I did manage to finish this quilt a few weeks ago. 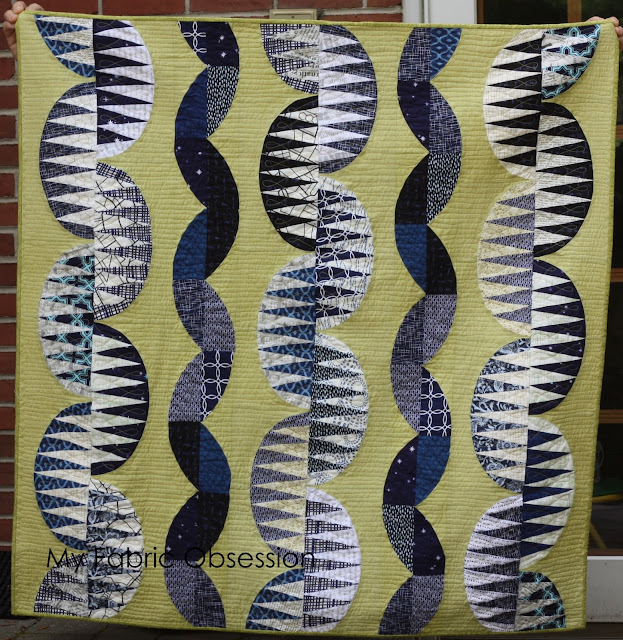 This quilt started as I took Sarah Bond's Tiger Melon Tiger Moon Class. I started making those navy and white melon pieces and randomly putting them up on my design wall. I decided I wanted them to be offset in a chain. as I kept looking at them on the wall, they reminded me of something else. I realized it was Sew Kind of Wonderful's Metro Twist pattern which I had already made. I started making those up for in between the melons and really liked the way it fit! 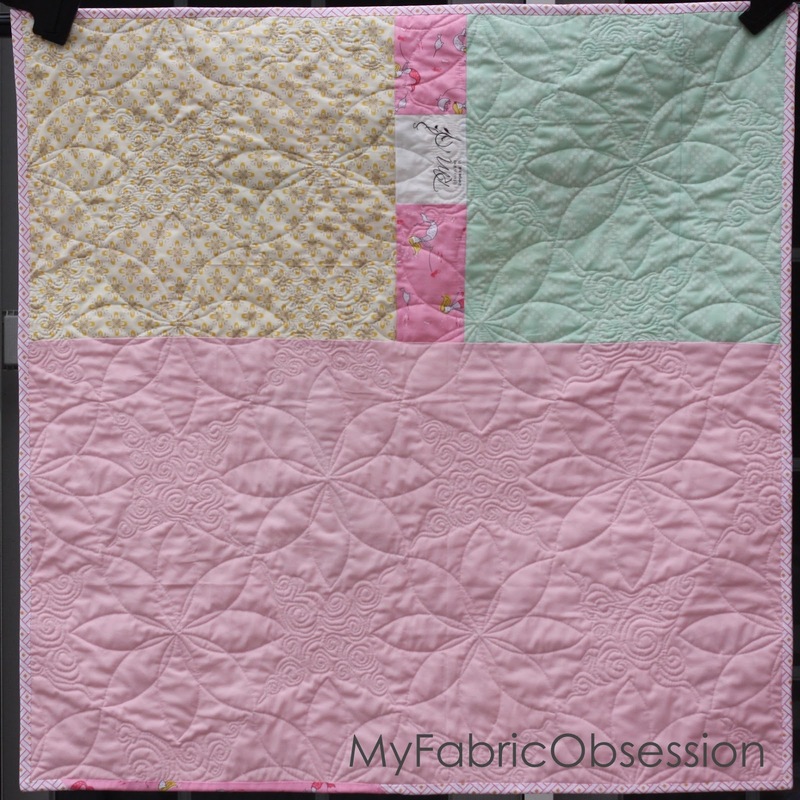 The quilting was all done by me on my domestic Bernina 2something. Lots of figure 8's and close straight lines. You can see more of how it looks on the back. 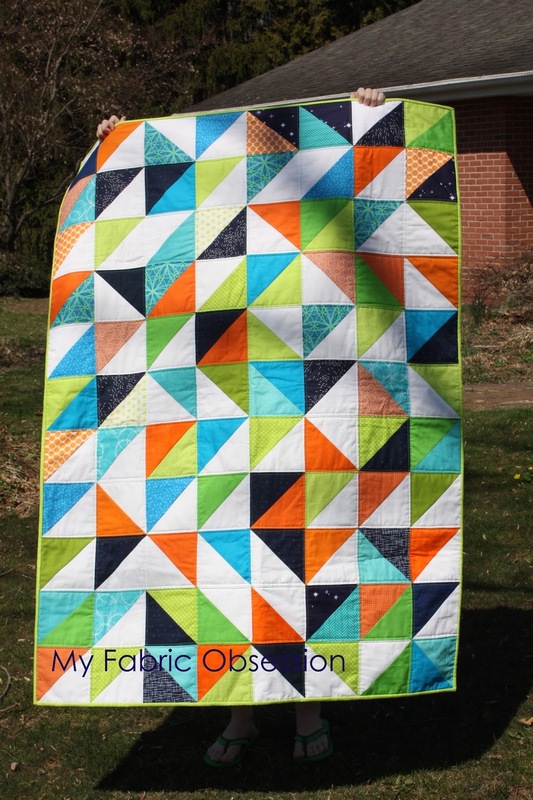 I didn't get any close ups of the binding, but it's a Tula Pink fabric in a shade darker than the background green. Finished size: 45" x 46"
You'll notice this quilt looks a lot like the last quilt that I posted. That's because when I made the last quilt, I let the kids cut a bunch of triangles with my AccuQuilt Go without doing any math. 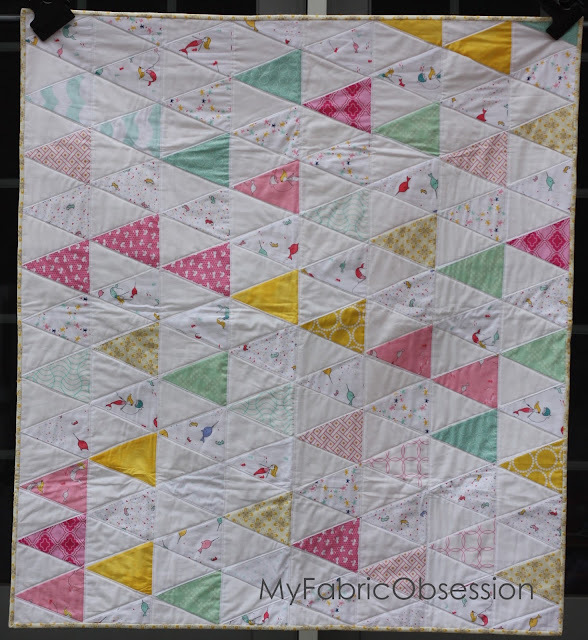 This quilt is the result of having way too many triangles!! 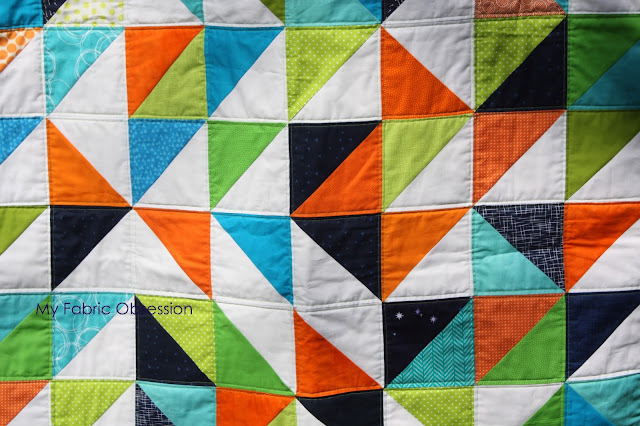 What I love about this quilt is that at first it looks like random triangles. But as you get closer you can see they are actually octagons! 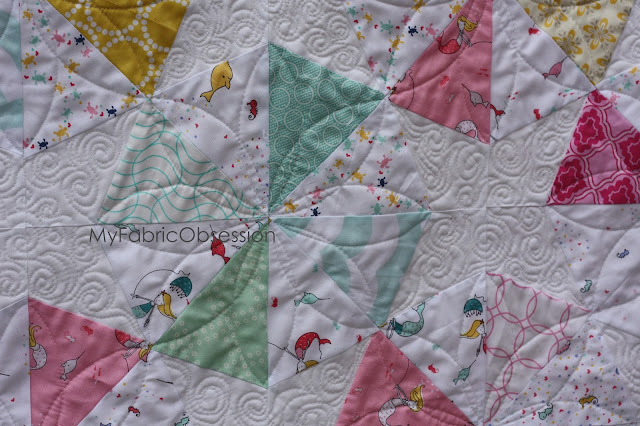 I did free motion and ruler work quilting on this one and I'm quite proud of how it turned out. I really wanted to set those octagons off with the quilting because they are so "low volume". 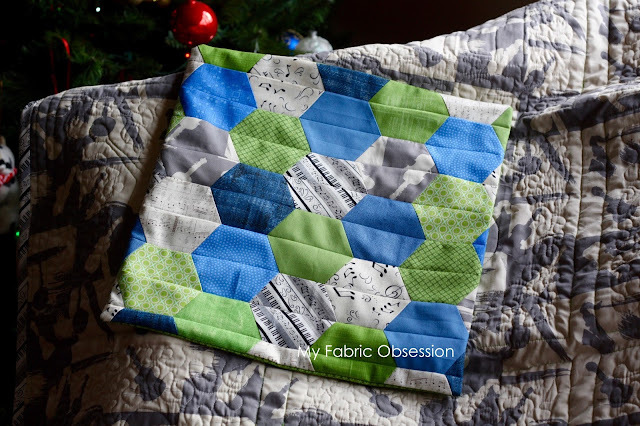 The binding is fabrics from within the octagons. And the back is more of the same. 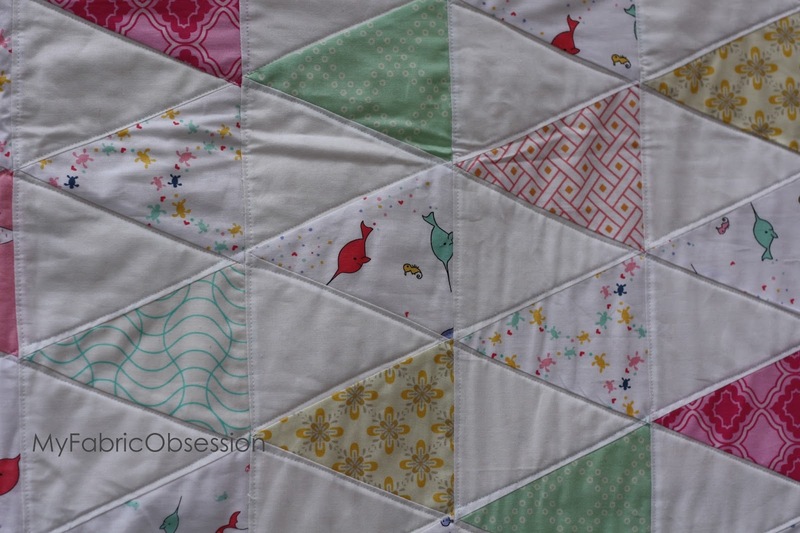 I'm quite proud of this quilt in general because it was the first time I developed my own pattern. 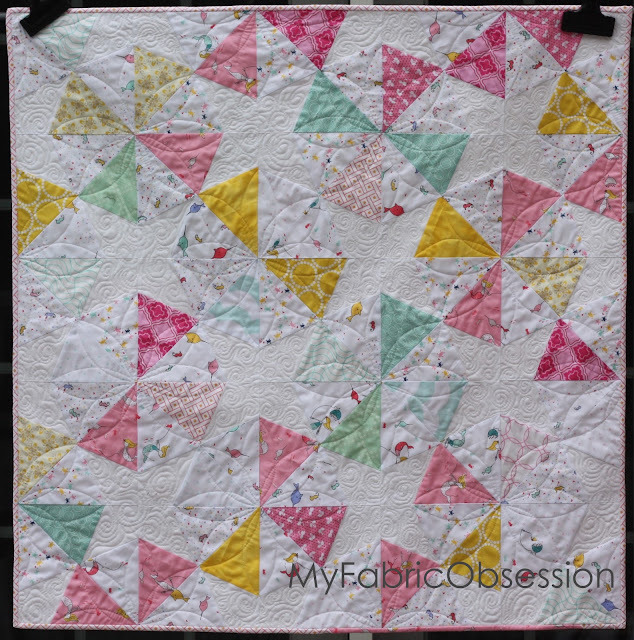 I had these triangles and wanted to make an octagon without doing any Y seams. It was quite an interesting process, but it came together well!! You can find this quilt for sale on my etsy shop. 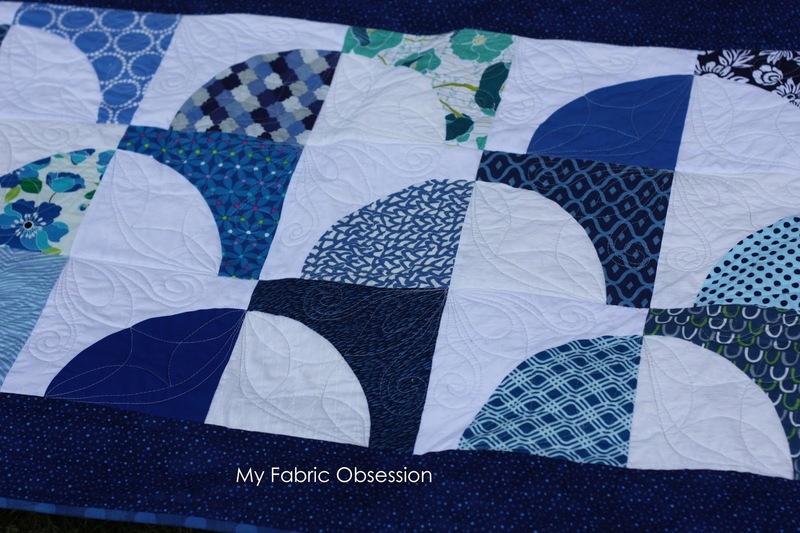 I recently finished up this sweet little nautical quilt and wanted to share it here. 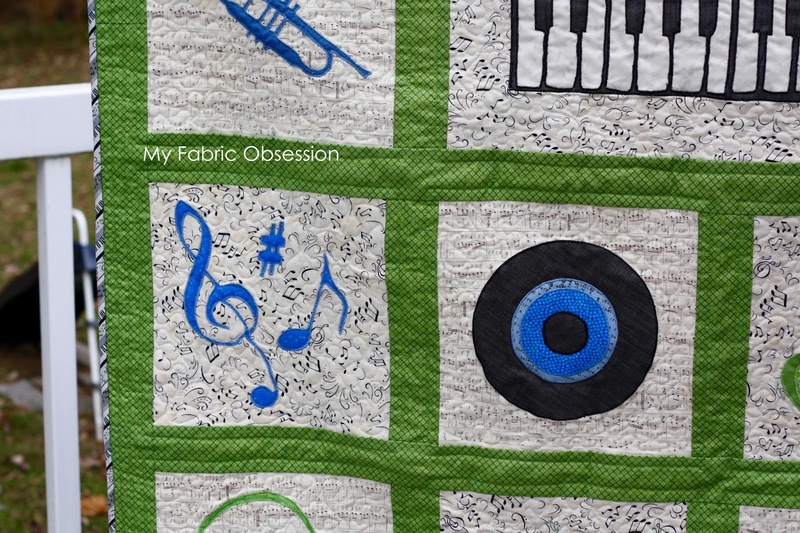 This quilt was made with my accuquilt go cutter. 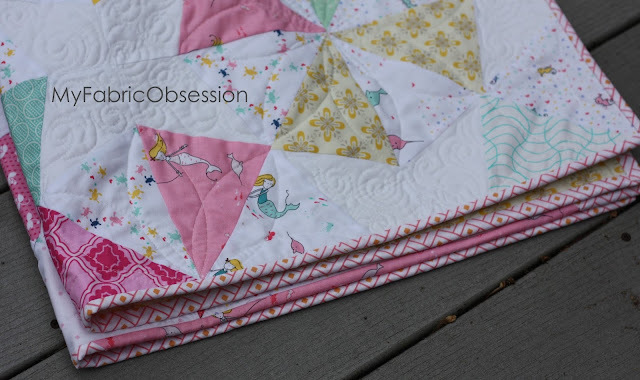 I had my two little minions cut a bunch of fabrics up for me knowing that I wanted to make a basic triangle quilt. The nautical novelty fabrics are Cinderberry and the rest is from my stash. Aren't those little animals and mermaids the cutest!? 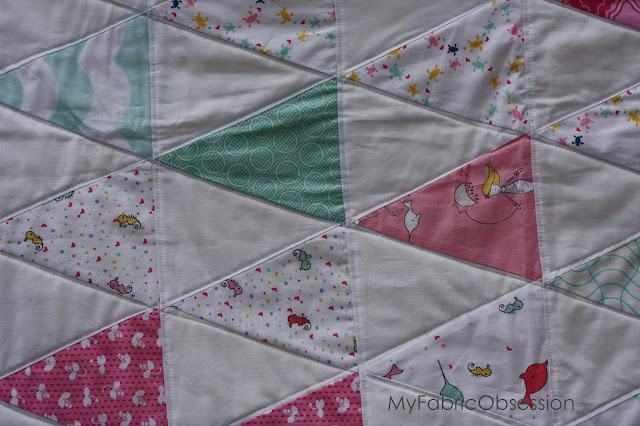 I did a very simple straightline quilting on this to keep it soft and cuddly. 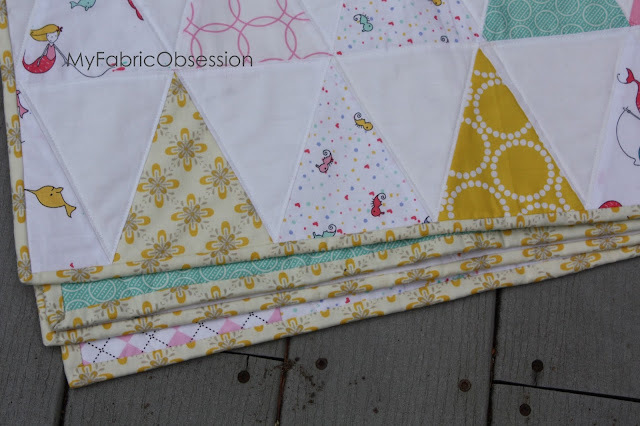 The binding is all the yellow print from within some of the triangles. You can see more of the creatures on the back. 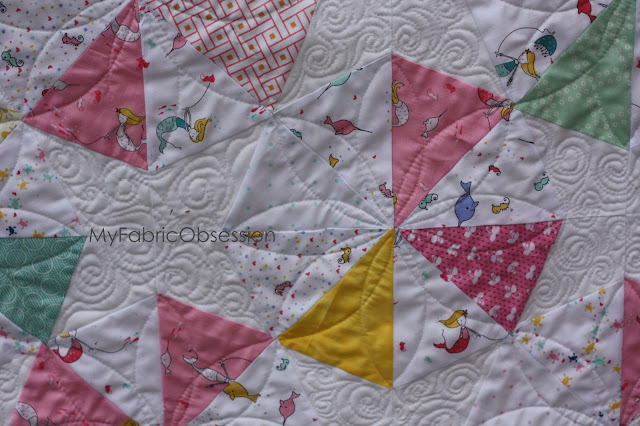 This sweet little quilt is for sale on my etsy shop right here.